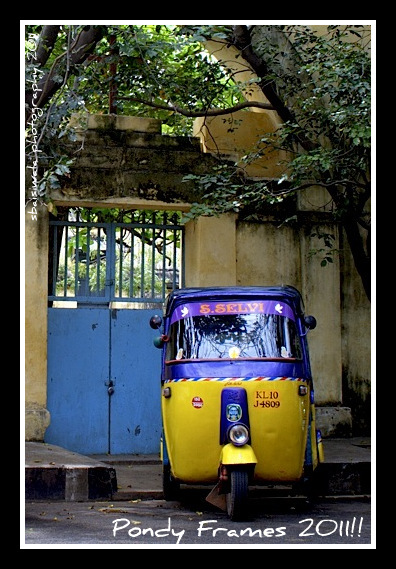 22nd Feb 2011 – As I stepped off the sleeper bus at the bus stand, first thing I noticed was the lovely auto rickshaws!! Yeah, you read it right – lovely is the word for the autos out there. First of all, none of the pushy,aggressive hard sell by the autowallas to hire their services; second is the lovely colors – they were all painted in bright color combinations; third is the clean, well-maintained look of the insides and fourth was the upholstery which was not your typical cheap rexene but some good quality one with patterns or color or texture. Nowhere have I seen such clean and nice looking autos in the whole of India. And the horn on these is the traditional old-fashioned “bhopu” with the weirdly funny sound!! The streets of Pondicherry (on the French Quarter side at least) are filled with gorgeous bungalows and mansions in the traditional French architectural style – French windows, bamboo chik curtains, tall columns, wide verandahs and loads of Bougainvillea in all possible colors which vie in sharp contrast to the color of the house. All of this makes for such a pretty picture where ever you look. I was simply bowled over by them and couldnt resist clicking them one after the other. While taking this pic, a bike rider zapped me by stopping dead in the middle of the road, so as to not to disturb my shot – and he gave me a wide smile after that too. I could only mumble my thanks since I was in such shock!! I was lucky enough to stay right next to the Pondicherry beach or the Serenity Beach and could walk across whenever I felt like it. The beach is a pretty narrow strip of sand, bordered by huge black rocks which have been put there to stop the sea from eroding into the city land. The entire beachfront was in the process of getting a facelift; as a result construction activities were on. 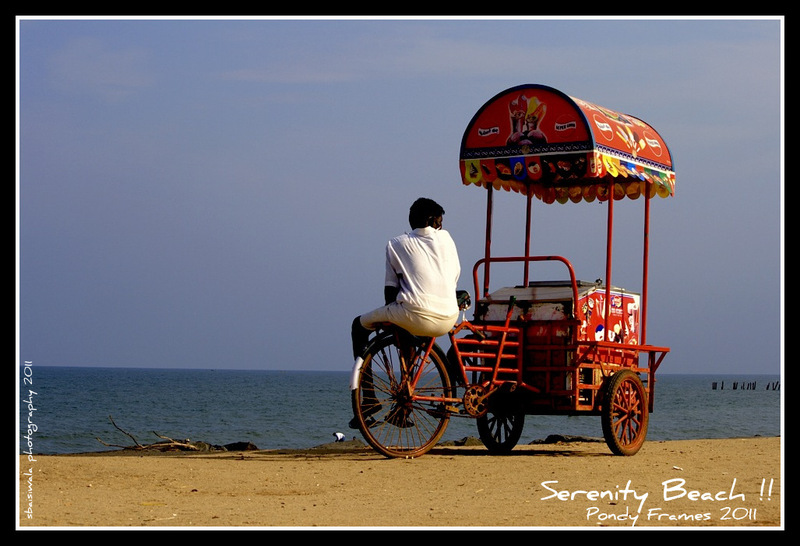 I caught this ice cream vendor idling away on the beach and thought he made picture perfect sense of what Pondicherry is all about – a calm and relaxed place. The beachfront gets quite crowded early mornings and in the evenings as its frequented by loads of walkers. Lecafe on the beach affords a beautiful view of the Bay of Bengal and a tall glass of cold coffee as well. One of the waiters there informed me that they are open 24 hours, no matter what. I thought it’s a great place to catch the sunrise and a good early morning breakfast while the waves crashed on the dusky shores. 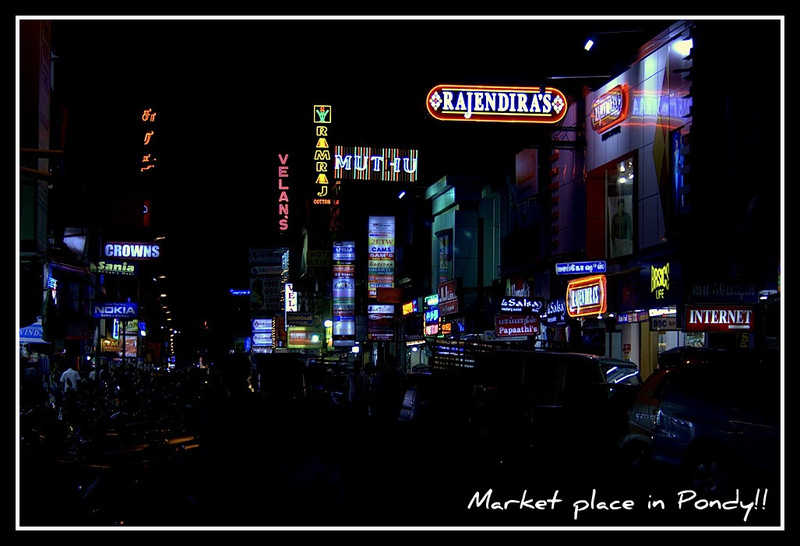 I have yet to experience it and look forward it on my next trip to Pondy soon. Thanks to my cousin Abhishek, I got to ride on a Royal Enfield while in Pondy; we cruised down many “Rues” to allow me to soak it all in. 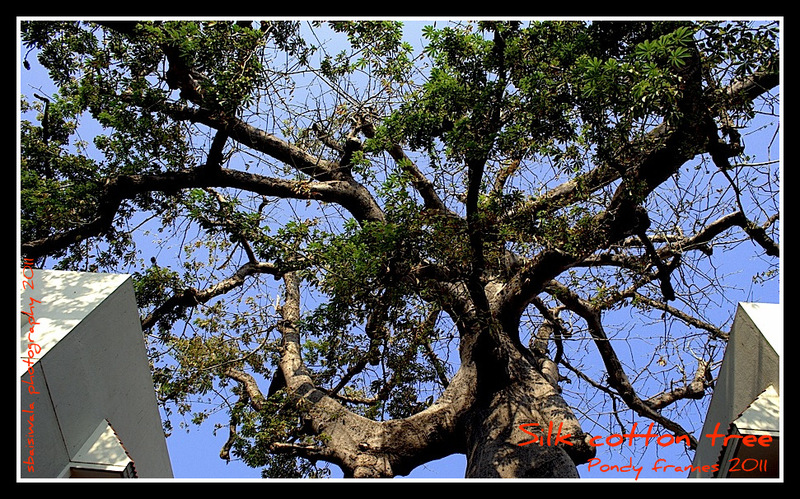 On one such ride, he pointed out this tree to me – its a Silk Cotton Tree and one of the oldest out there. The roots of this massive tree apparently have travelled up to a few blocks!!! It’s a protected tree (INTACH) and the owners on whose property this tree stands cannot cut it down. INTACH has worked out a solution to stop the roots damaging the houses by installing steel plates all around the roots to protect the foundations of the house. It was quite an imposing site to stand under the tree and gaze upwards. I only wish it in season – I would have so liked to see the flowers and then the cotton puffs! the whole town. The story goes that the ruling king and his aides passed by a house which was lit beautifully; they took it to be a place of worship and bowed their head in observance. But when the passerby expressed horror since it was the abode of a courtesan; the King ordered the house to be demolished immediately and a water tank to be raised in place. At this Aayi begged the king to allow her to do the deed and pay for her sins. The monument lends quite a character to the park with its graceful architecture. The Sacred Heart Church in Pondicherry is more than a 100 years old. Its located opposite to the Pondicherry railway station and is quite an impressive structure. I was blown away by the beauty and the number of the stained glass panels in this church. 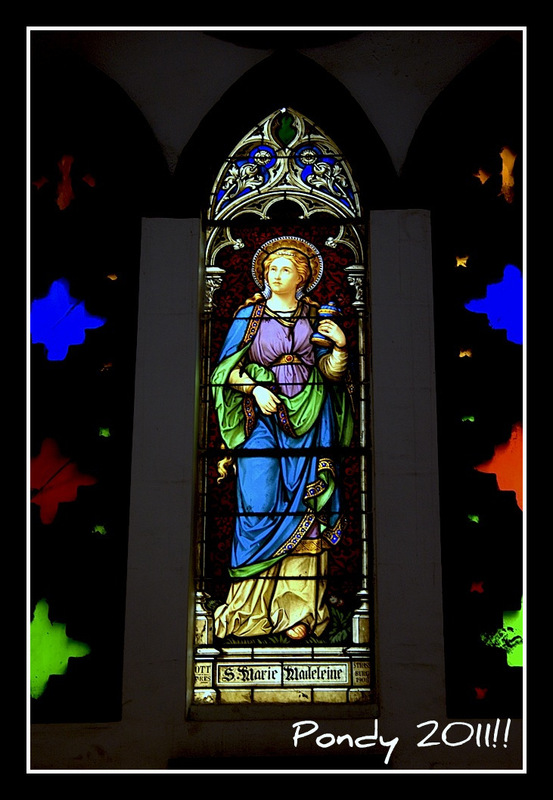 There are 14 round stained glass saints display and 14 full-sized stained glass saints display inside the church. 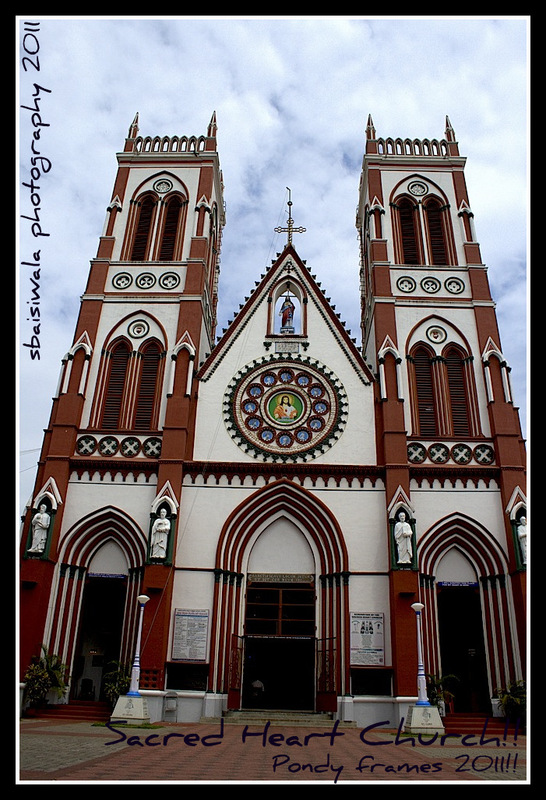 This church is quite a landmark of Pondicherry and is supposed to be built as a replica of the Montmartre of France. 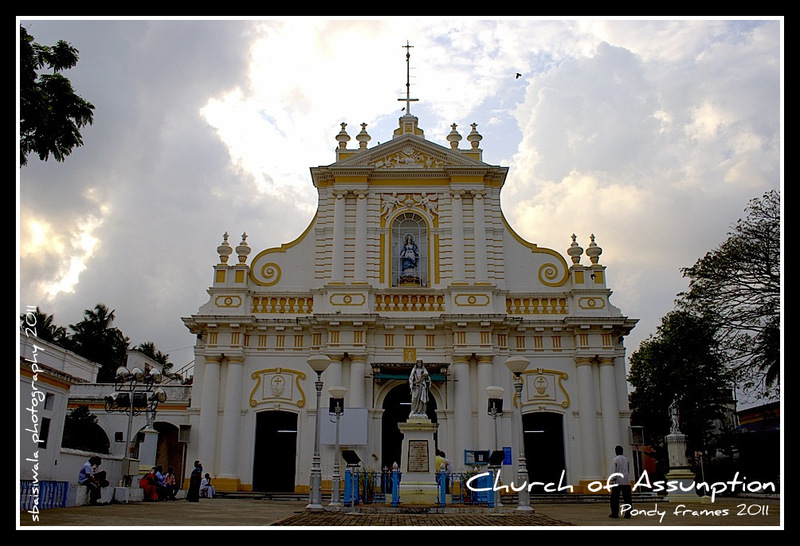 The other noted church that I visited in Pondy was the Church of Assumption. This church has some really beautiful French cultural and architectural elements in it; making it a very graceful structure. I loved the yellow and blue hues in this church – the colors have imbibed so much character to this building. It’s quite a huge building with an equally big compound, dotted with tall verdant trees with beautiful green canopies. All in all a very picturesque building in a very picturesque setting. it approved of the zoom lens bearing down on his privacy in the garden. I managed to get this shot, before it scurried away to hide from me. And then no trip to Pondy is complete without a visit to Auroville – the famed colony setup by Mother Mira and Sri Aurobindo. It’s a gorgeous settlement, nestling on the outskirts of Pondy; just off the ECR. Riding on a bullet on a narrow road, I could smell citrus in the air. 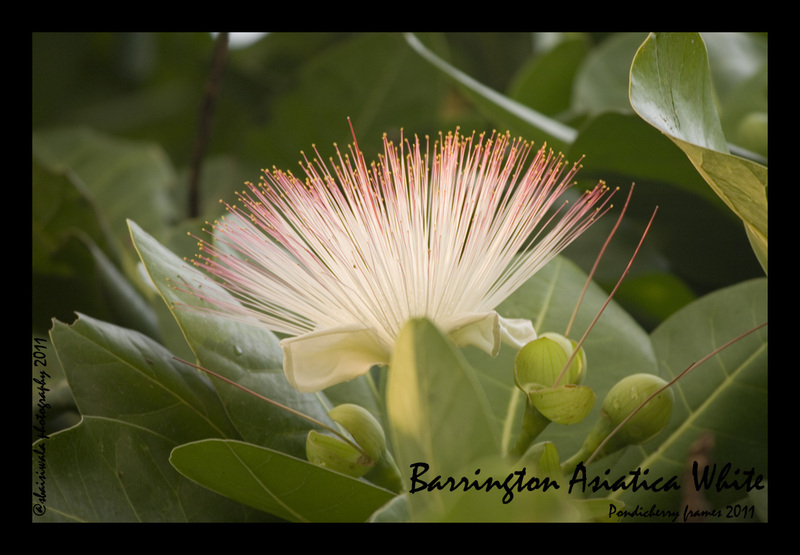 I was told this is from the cashew trees which were growing in abundance on either side of the road and were flowering at the moment. The trees were huge with big canopies and were so laden down with their weight that the branches of most were sweeping the ground. A glimpse of Matrimandir and I was in total awe – it casted a spell on me like no other. I have been wanting to go back to Pondy to go for a meditation session there someday soon. It’s a brilliant piece of architecture and inspires total awe!! The peace, cleanliness and the aura of the entire place was refreshing. The Auroville visitor centre has a small cafe with some refreshing fare; 3-4 boutiques where handicrafts, incense, clothes, etc are sold, an art gallery and the audio-video room where you get to see a small film on the Matrimandir and its conceptualization. One is issued a viewing pass for the matrimandir; you have to walk about 1 km on a shaded pathway and get to see it from a distance of about 500 mts. I loved the organised feel of this settlement; so many volunteers carrying out odd jobs, clean roads, quiet traffic, separate track for walking/cycling, etc. Someday I am going to get back there to spend some time living in the settlement and experience it on a day-to-day basis. The atmosphere of the place is something one needs to gradually soak up. And of course I shopped in Pondy to my heart’s content. I found some real treasures out here besides the usual incense sticks, perfume oils, diffusers, etc. Shops like Kalki, AuroShikha, AuroBoutique and Casablanca were my favourite haunts out there. I picked up some beautiful pottery pieces as well; especially an incense holder which is quite unique. And then there was the marbling unit from where I picked up a gorgeous chiffon saree in marbling effect and some hair scrunchies too. And of course I picked up some leather bags as well – Pondy is quite a place to shop for leather items – my favourite haunt for leather was AuroFurn. KSRTC runs a day AC Volvo bus service between the two cities which was much safer option. I spotted loads of birds enroute. The most scenic spot was the Fort of Gingee – about 60 kms from Pondy. I couldnt make the time to visit it this time. 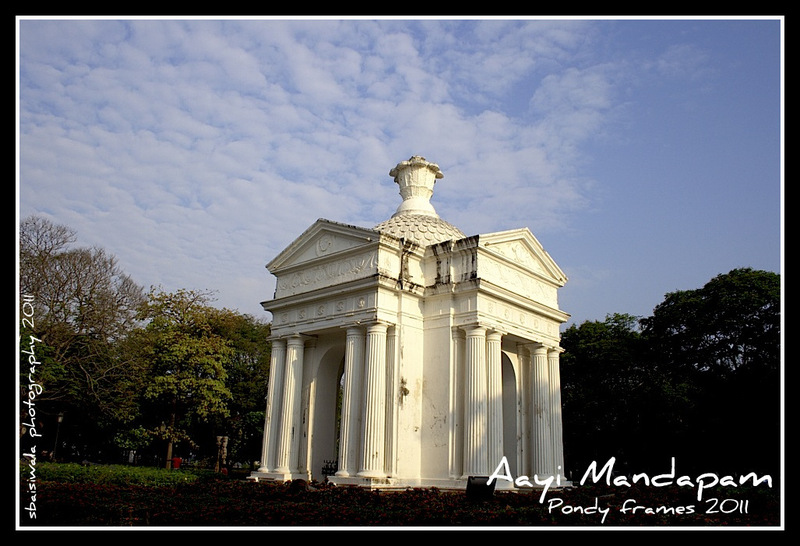 Its supposed to be quite a popular picnic spot from Pondy. 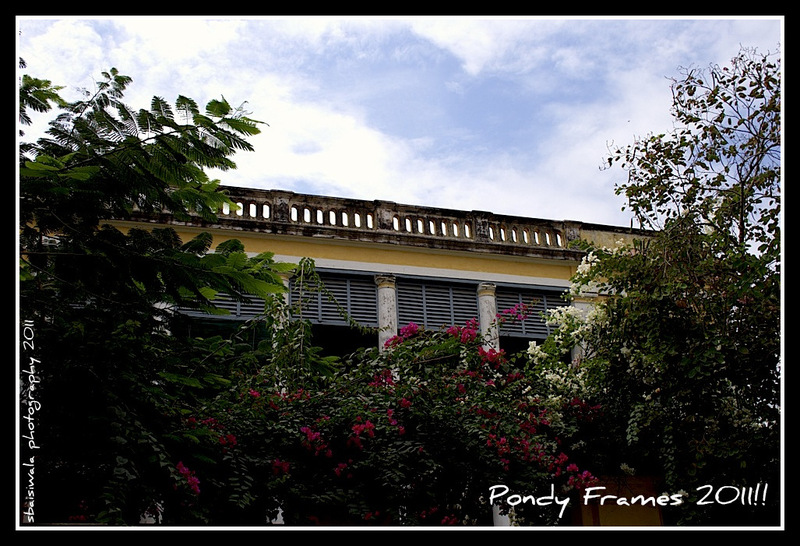 Pondy is quite a neat, clean city with loads of great architecture – all being preserved by INTACH. Loads of options for rentals for bikes, scooties and mobikes to enable one to get around in the almost nil traffic of Pondy. coffee dot com for some really great cold coffee; some net surfing and a cool place to smoke on the outer verandah where you generally tend to make some friends. Some nice breakfast at Hot breads and Daily bread. Have you been to Hampi? Check out my posts on this gorgeous World Heritage Site as decreed by UNESCO and marvel at the architecture, history and the atmosphere of every rock, hill and mountain. WOW!!! Great photographs and nice selections and superb skill you have ,Wish you all the best in your both career and great achievements in your life. Thanks so much Dhanesh for reading the blog and appreciating it too!! I haven’t been to Pondicherry, but it’s on my bucket list. Have heard a lot about it, and being a person who loves France and anything to do with, I want to visit this place that has so much French influence on it. Will need to bookmark your post, Shalini for whenever I visit Pondi! Such a lovely travelogue. Makes me want to go to Pondicherry now! Lovely pictures with beautiful write up !! 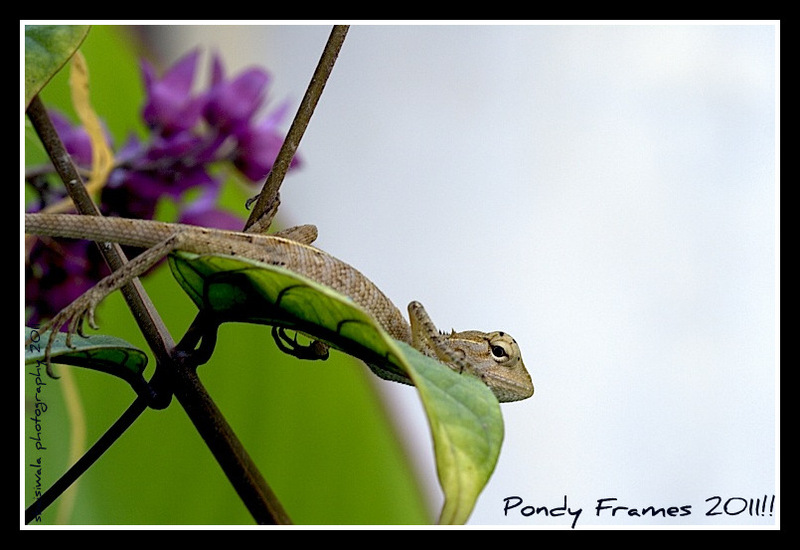 Great to visit Pondicherry via your post. Thanks so much for dropping by ANita- you must visit Pobdy; its an amazing city for tourists and has some great food and architecture on offer.